States of Sentiment is organised around four ‘sentiments’—well-being, suffering, aversion and hope. 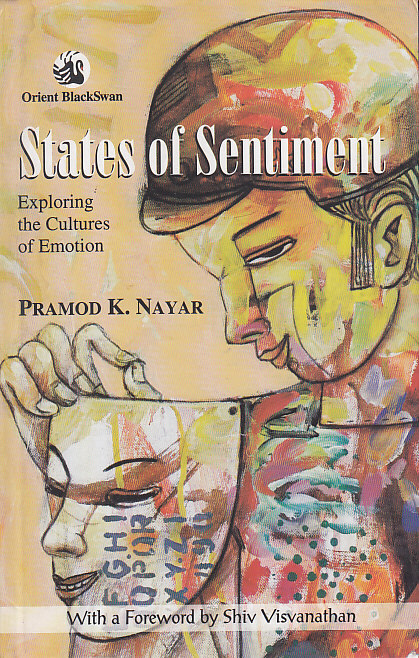 It uses reality TV, hate speech, self-help literature, media coverage of 9/11 and 26/11, autobiographies, websites and films, and blends theoretical insights with elements of innovative inquiry, to show how emotions are packaged and how these emotions then determine social relations themselves. Categories: Media and Culture, Orient BlackSwan, Publisher, Social Sciences. Tags: 9788125041993, Cultural discourse, Emotional relations, Pramod K. Nayar, Social relations. States of Sentiment proposes that our responses to various situations, events and representations are not entirely private, individual and internal. They have a crucial social dimension. Emotions are a result of the internalisation of cultural codes and discourses that inform, and even determine the appropriateness or inappropriateness of emotional responses. We see a terrorist as a threat, a cyclone as worrying, a rags-to-riches story as a feel-good moment. We mourn the sudden death of Michael Jackson, we rejoice in the victory of a triumphant Tendulkar and we react with horror and shock to 9/11. All of these are emotional responses to specific representational strategies that present these people and events in particular ways. These strategies in turn construct our emotional relations to the events and people. Exactly how sentiments of care, passion, desire, pleasure, fear, sympathy or pity are discursively commodified (made a commodity) in the mass media, films, reportage and the other public cultural forms today is the subject of this book. It demonstrates how cultures today are getting emotion-driven.